Lay one sheet of phyllo dough in the pan and brush it with butter. Lay another sheet of phyllo on top and brush with butter. 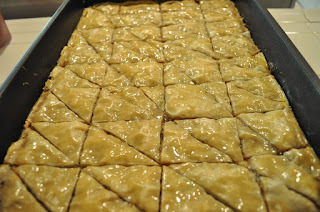 Repeat until the filling is used up, reserving 5 sheets of phyllo for the top layer. Bake until puffed and golden 30 to 35 minutes. Pour hot syrup over the baklava and let it stand at room temperature until syrup is absorbed, at least 3 hours. To store, keep at room temp for up to 3 days.